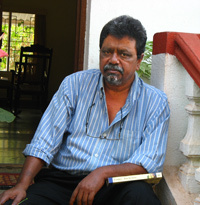 Manohar Shetty has published five books of poems, including ‘Domestic Creatures’ (Oxford University Press, New Delhi). His poems have been widely published and anthologized. In the UK his poems have appeared in ‘London Magazine’, ‘Poetry Review’, ‘Wasafiri’ and ‘Poetry Wales’. He has edited a special edition on English language poets of India for ‘Poetry Wales’. In the United States his poems have appeared in ‘Chelsea’, ‘Rattapallax’, ‘Fulcrum’, ‘Shenandoah’ and ‘New Letters’, and in ‘Helix’ in Australia. Several anthologies feature his work, notably ‘The Oxford-India Anthology of Twelve Modern Indian Poets’ ( Ed Arvind Krishna Mehrotra, OUP, New Delhi). His poems have been translated into Italian, Finnish, German and Slovenian. He has been a Homi Bhaba Fellow and a Senior Sahitya Akademy Fellow. An in-depth review of some of his works that brings us closer to Manohar Shetty the poet, and the person, appears in The Caravan Magazine. He has rediscovered Goa in his writing and his poems. One of his love poems, ‘GIFTS’ has appeared in Arvind Krishna Mehrotra’s ‘The Oxford-India Anthology of Twelve Modern Indian Poets’, and from there into an Italian translation for a journal called Clandestino, and then into a wonderful, multilingual anthology of love poetry, Amore in Verse, published in Rome. A more detailed biography and an assessment of his work would appear in Asia-Major Reviews soon.